I really likethe design of the Evil King, halway between Skeletor and Joe Dalton. Does his dughter have a name? I cant wait to see more of this father / daughter relation! Good luck in your quest and ahppy new year!!! Great start! Adding this to my daily Webcomics bookmark folder. Hey! If this works! I won`t mind go daily! Intriguing setup, we want to know more! Liking the start, curious about what kind of webcomic this’ll be, want to see Henbe’s sense of humor. Without repeating everyone else too much, I really like the concept and enjoy the art style. 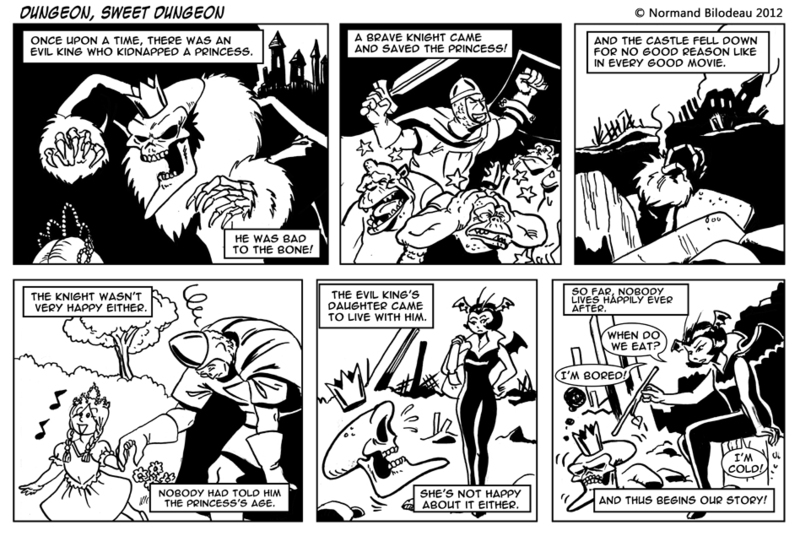 This is one of the few webcomics that has hooked me on the very first comic. Really looking forward to reading more of these and seeing how this develops. Glad to hear you’re enjoying it. It’s one of Henbe’s strengths to tell good stories and set strong characters in few panels. He’s got a huge buffer already in the can (20 more comics already ready to go) and I can promise you they’re great. Long live the Evil King! I noticed some minor grammatical errors, like it’s supposed to be ‘the king’s daughter’ not “the king daughter”, sorry for that sometimes improper grammar in the narration takes me out of the story. Oups! I’ll have to correct that. Thx!